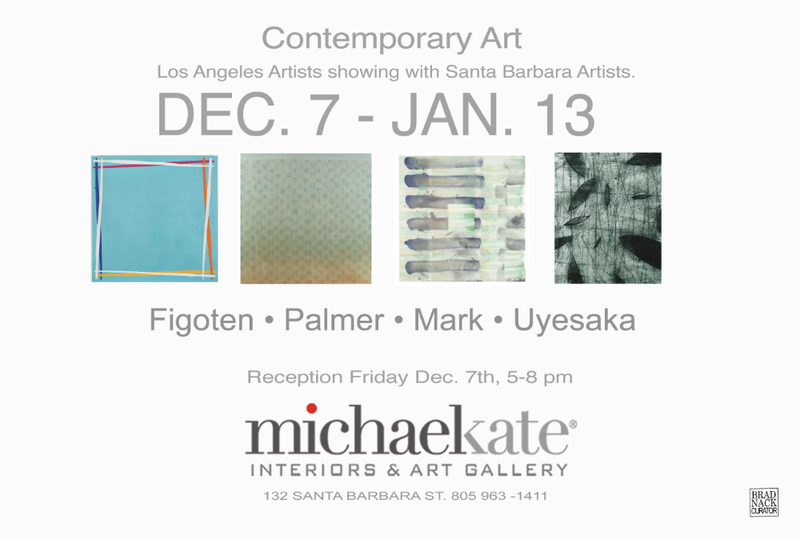 Our next art reception at MichaelKate will be from 5 – 8p, December 7, 2012. This show and opening is very exciting in the cohesiveness, scope and uniqueness of the 40 works presented by 4 artists for the this exhibition. By pairing two artists with roots in Santa Barbara (Dug Uyesaka and Dana Mark) with two artists working out of Los Angeles, (Gary Palmer and Sheldon Figoten) MichaelKate Interiors and Gallery is providing an opportunity for the community to see large scale works in a big room. This is a great chance to see art that in many ways represents the current contemporary Southern California art scene. Before you drive to LA, stop by our 10,000 square foot showroom to catch this amazing grouping of work. Dec. 7 – Jan. 13.